I came upon this question while listening to David Stockman make his pitch for his Bubble Financing newsletter. Evidently he made some money by correctly anticipating the downfall of a biotech exchange traded fund(ETF) and was now predicting the demise of the 3 trillion dollar ETF market. The problem I had with his argument was that the risks facing a small, single sector ETF comprised mainly of startup biotech companies are considerably different than the risks facing a large ETF based on a well diversified portfolio of stable, liquid stocks. It was especially ironic that Agora Financial was sponsoring the Buble Financing video since another one of their advisers, Jim Rickards, has been recommending an ETF that I have owned for several years as part of my large company asset category, Schwab US Dividend Equity ETF (SCHD). I doubt anyone would make the argument that an ETF like SCHD is as risky as a biotech ETF. This comparison becomes even more stark when you look at the liquidity and diversification of the largest ETF, SPY. Then we get to the mutual fund question. Although ETFs are relatively new, mutual funds based on indexes have a long history. Is Mr. Stockman really saying that a large, stable ETF based on the S&P 500 such as SPY is significantly riskier than a mutual fund based on the same index such as the Vanguard 500 Index (VFINX). History has shown these two assets have similar risk and performance and brokers and customers look at them as being equivalent. As an old school MBA who constructed his retirement portfolio with large, stable ETFs, I thought I should do a little investigating. Was there a higher mis-pricing risk or other risk associated with ETFs that is not present in mutual funds or was this just another rant by a stock picker against the index funds strategy? To put this investigation in perspective I started working in the 1970s. In the 1970s many defined benefit pension plans were under attack for under-funding by businesses and by embezzlement and fraud by the fund managers. It comes as no surprise that 401k plans were born to add a bit more honesty and accountability to the ugly retirement funding situation. In the 1980s private companies quickly replaced their defined benefit plans with 401k plans and added better fund performance reporting as a safeguard against the misdeeds of the past. Typically these companies offered their employees four investment options, company stock, a mutual fund stock plan, a bond plan, and a money market fund. The 401k plans became popular and reasonably well-understood. It did not take long before it became common knowledge that most of the stock plans consistently under-performed the S&P 500. By the end of the 1980s the HR directors got fed up with the employee complaints and the repeated excuses by poor performing fund managers. Since the academic research said that index funds out-perform most fund managers their solution was too either add index funds as an investment option or to require a significant portion of index funds in the stock portfolio option. The battle lines were drawn. Fund managers needed to start beating the S&P 500 on a long term basis to justify their fees or the HR directors would going to divert even more of the investments to the very efficient S&P 500 index funds. In the quest for higher performance for retirement accounts, low cost index mutual funds and ETFs grew into a 3 trillion dollar behemoth. In the last eight years most of the growth has come via index ETFs. So what was David Stockman complaining about? As far as I can determine both the ETF, SPY, and mutual fund, VFINX, fall under the same SEC rules. If there is a systemic risk with SPY then that same risk affects VFINX. Since VFINX was created in 1976, history tells us that the systemic risk for this asset class is very low. I agree with Mr. Stockman that an ETF such as SPY will occasionally have times the in which the ETF does not accurately reflect the value of the underlying securities. The mis-pricing risk is a problem for market makers and day traders. I am not sure how much a long term investor cares about daily fluctuations. If an ETF such as SPY is faced with a severe drop in the underlying assets, I am not sure why Mr. Stockman thinks the fund managers will be forced to redeem ETF shares and sell stocks into a declining market. The liquidity risk in Mr. Stockman’s doomsday scenario is real but this is the same risk as a run on a company stock like Apple or Exxon. Although making a market in a declining or rising security may be scary or painful, market makers having been doing this in good and bad markets for a very long time. Through the seven years, Vanguard’s 500 index fund, as represented by its Admiral shares, is up 63.5%. That’s the portfolio carrying Buffett’s colors. Protégé’s five hedge funds of funds are, on the average—the marker the bet uses—up an estimated 19.6%. One of the most contentious issues brought up by the Congressional Budget Office report on the Affordable Care Act is the job losses. It is by design that the Affordable Care Act allows people to choose to turn downsize their job and replace their employer sponsored health care plan with an equivalent one from the exchange. There are people who have valid medical or personal reasons who want to pursue this path. These are intentional job losses and probably desirable. The problem is keeping the people who really do not have a valid reason for downsizing their job from pursuing this strategy. As much as we might want to compassionately encourage the former group to downsize, we really want to discourage the slackers from going down this path. Unfortunately the Affordable Care Act does not really have a plan of disincentives for these prospective slackers. If we really believe we can grow out of our economic mess and pay for an expanded health care system then we must minimize the number of slackers. Before the Affordable Care Act transforms our health care system in to a “Mini-Me” version of the European system, it may be a good time to revisit Planet Money’s podcast, Germany’s Painful Unemployment Fix, and Germany’s use of incentives and disincentives to bring down unemployment rates. It is ironic that the reforms that made Germany’s labor market look more like the labor market in the U.S. may eventually be adopted by us as our welfare state repeats the same mistakes Europe made. Oy vey! For a more scholarly review of the impact of the ACA on employment you can read Rea Hederman’s article, ”Incentives Matter: Why Estimated Job Losses Under Obamacare Have Tripled” and University of Chicago economist Casey Mulligan’s paper, “Average Marginal Labor Income Tax Rates under the Affordable Care Act”. Over the weekend I was amused listening to the Plant Money podcast, Dear Economist, I Need A Date. On the show they had the economist and author, Tim Harford, using economic theory to give love advice. While chuckling at his advice I was struck with the idea that most of the proposed fixes to the Affordable Care Act requires us to ignore the Sunk Cost Fallacy. For those who are unfamiliar with the concept of the Sunk Cost Fallacy, here is a nice synopsis from The Skeptic’s Dictionary. To continue to invest in a hopeless project is irrational. Such behavior may be a pathetic attempt to delay having to face the consequences of one’s poor judgment. The irrationality is a way to save face, to appear to be knowledgeable, when in fact one is acting like an idiot. The Affordable Care Act supporters and a majority of the people in the United States would like the Affordable Care Act to be fixed despite the fact that most of them acknowledge that the www.healthcare.gov website and those narrow network insurance plans look like hopeless investments. The idea that we cannot keep our existing health care system of doctors and insurance plans with these new plans begs the question whether this investment has no hope for success even with additional tweaks. The problem is simple. I can understand why insurance companies want me as a healthy person to buy their plans. I do not understand why I should. 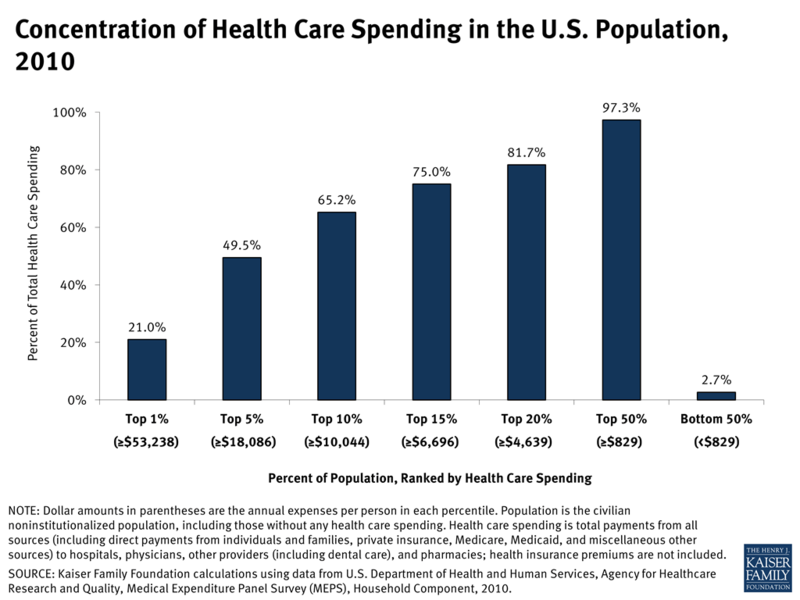 If we remember one of the important characteristics of health care expenditures in the United States, half of all health care costs in the US is concentrated in only 5% of the population. If you are not part of that 5% and you are financially disciplined, the odds of you being successful with self-insurance is pretty good. All you are doing is copying the same plan the insurance companies are using to pay for the 5%. The high cost of the ACA insurance premiums becomes a very powerful incentive for self-insuring. If you are successful with your self-insured health care plan, you get to keep the rewards.The Sunked Cost Fallacy reminds us that it is irrational to continue to invest your money into the Affordable Care Act web site and health care plans and hope that things will get better. Here is an old graph from the Kaiser Family Foundation for you to ponder. I wrote most of this comment on the post, Why Not Delay the Individual Mandate?. Then I thought of another individual mandate alternatives and added it this post. Okay, let’s get real. My family is healthy and we purchase our insurance through the individual market. Our rates are low compared to the proposed rates available via Affordable Care Act. We have a real possibility of 100% increase in our insurance premiums. I have skin in this game. If uncompensated hospital care is the primary problem, then I prefer our existing system in which these costs are spread over a much larger population. If adverse selection is the primary problem, the Affordable Care Act proposal is only slighter better than doing nothing. Even the ACA supporters recognize that their proposal most likely will not work if the a few high cost patients get insurance(charity) in the individual market. This market is just too small to support many high cost participants. The only workable solution is to spread this charity over a larger population group. There are several ideas on how this can handled. Some ACA supporters argue that we need to go to a single payer system and the failure of the individual market is part of the path to this final solution. A few others are arguing that we should single pay these high cost un-insurable patients. I call this the Medicaid solution. A variation of #2 is that we expand the high risk insurance pool. The ACA high risk pool is presently closed to new participants. Another possibility is a Federal re-insurance plan to cover high cost customers. When you go over a certain payout amount, the government re-insurance kicks in. I think the Dutch use a variation of this idea to limit the risk a single unlucky customer will bankrupt the insurance company. I call this the FDIC solution. My gut feeling is that the most successful plan to create a workable individual insurance market is to stick the insurance companies with the un-insurables and let them lobby the state/Congress for help. When you piss off the middle class, you should expect that there are consequences. Another point that I did not make in the original comment was the point that the Urban Institute article made that one of the objectives of the Individual Mandate was to “to maximize insurance coverage” as if this would magically lead to better health care outcomes rather than outright theft from the middle class. Their idea is that if you build it, they will come. I call this the “Field of Dreams” health insurance argument. Unfortunately health insurance was a product created for the middle class. The rich do not need it and the poor cannot afford it. It worked for the middle class when it was affordable thirty years ago but not so well for the rich and poor. Despite the fact that health insurance was not working for the middle class, the ACA supporters took this idea and said that if we subsidize the the health premiums it should work for lower income people. This is a variation of the “free health clinic” argument. Unfortunately our experience with “free health clinics” is that they have been for around for a long time and we are still dealing with the same health problems. Do the ACA supporters really expect that “free health insurance” will have a different result than the free health clinics? My best guess is that health insurance does not heal people. Hospitals do not heal people. People heal people. Middle class people schedule doctor’s appointments when they find a health problem. Lower income people go to the emergency room when they find a health problem. Different strokes for different folks. As an example of the problem we are facing, for at least the last twenty years we have had approximately “free medical care” for “at risk” mothers in Hamilton county. This “free medical care” was tied to an aggressive campaign by Cincinnati Children’s Hospital to reduce infant mortality and yet we still have an infant mortality rate for black mothers that is twice the rate of white mothers. I only have to drive thirty miles to be surrounded by third world infant mortality outcomes. Health care outcomes for the poor is truly “complicated” and health insurance is a small piece of puzzle. I have no confidence that the Affordable Care Act will improve health care outcomes for the poor and I doubt that any progress in health care outcomes will be the result of a federal program. It was purely a political maneuver completely disconnected from the needs and desires of the poor and middle class. I find it truly amazing that people who did not buy health insurance before will become magically happy when they are forced to make their first health insurance payment. Obviously they are better people than me. I do not remember ever being happy making an insurance payment. My most amusing thought is that the ACA supporters think that a single, working mother who is living paycheck to paycheck will pay a health insurance premium rather than buying the latest basketball shoe for her teenage son. Talk about someone who is out of touch. I was recently reminded of this situation when I listened to Planet Money’s podcast, Episode 487: The Trouble With The Poverty Line. As a volunteer for Habitat for Humanity I heard several variations of this same story. The outcome of each story is still the same. Poverty is complicated. My wife and I’s favorite podcast is Planet Money. When Planet Money announced that they had formed a Kickstarter project to not only make a T shirt but to tell the whole story of how it was created, we had to participate. We are now officially one of the over 11,000 backers. They went over their $50,000 goal several days ago so the big question is whether they can get over $400,000 with only six days left. Since President Obama mentioned universal preschool I went back and listened to a very good podcast on the subject by Planet Money. Here is an article my favorite podcast, Planet Money, had on Norway Has Advice For Libya. This advice is appropriate for any state that is looking at expanding drilling such as Ohio. Perhaps, even more amazing is what the Norwegians decided to do with the money they made off the oil. Initially, they decided that the citizens of Norway wouldn’t see any of it. They choose not to spend it on schools, roads or sports stadiums. Instead, in the beginning, they reinvested almost all the money they got back into the developing the oil industry ”” into drilling new wells, doing new explorations and developing new technologies. Today all that money is in a savings fund called the Government Pension Fund Global, and the Norwegian government only gets to spend the interest that fund makes. The size of the fund right now is about $547 billion dollars. Tom Blumer wrote a related article on Watchdog.org, Blumer: Kasich’s tax could affect OH job growth. It looks like if Ohio can develop the oil well service business, Ohio unemployment problems in south eastern Ohio could dramatically improve for many years. If Ohio can develop a viable long term industry, Ohio might be able to put together a trust fund like they have in Texas that provides capital improvements on state universities and slows down the growth in college tuition expenses.